There is perhaps no single vehicle safety system more important in racing than brakes, and no single part of that system is more critical than brake fluid. At Competition Motorsport, we got tired (and a little nervous) of using "racing" brake fluid on the track that didn't live up to its claimed performance when things heated up. 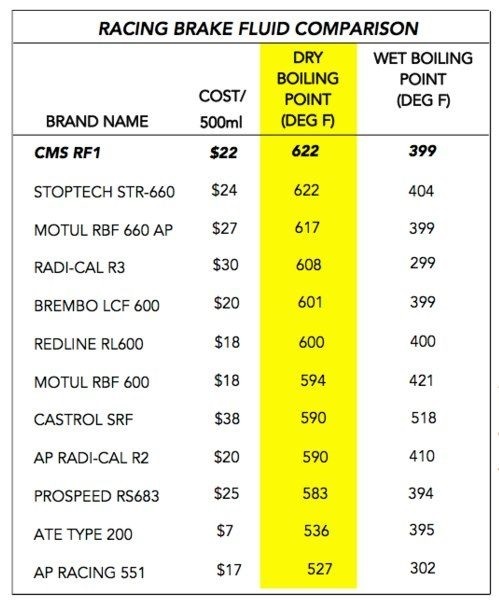 CMS’s RF1 racing brake fluid has the highest dry boiling point on the market while saving racers money compared to our nearest competitor, and with our 6- and 12-bottle discounts the savings grow even more! Don’t think you’ll use an entire case this season? No problem; split a case with a friend and you’ll each save $2 per bottle! CMS’s RF1 was manufactured in partnership with the brake fluid supplier to Formula 1 and performs as such. Our RF1 Racing Brake Fluid is formulated to maintain consistent viscosity, lubricity, and compressibility at the extreme temperatures and line pressures found in racing, track days, and spirited driving. Some people don’t understand the importance of wet versus dry boiling points, so we’re going to “boil it down” for you. Dry boiling point is calculated using fresh brake fluid (i.e. from an unopened bottle). Wet boiling point is calculated based on the brake fluid being saturated with water, which occurs naturally over time; this ocurs by water vapor penetrating your flexible brake lines. Let’s be honest here: if you’re racing or doing track days and only changing your brake fluid every 6 months you’re asking for trouble. The dry boiling point is the most important measure for racers and HPDE participants as long as you keep your brake fluid fresh (i.e. flushed every 3 to 6 months). 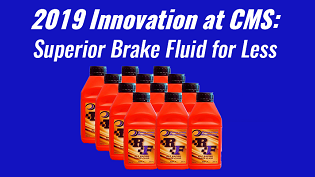 CMS’s RF1 Fully Synthetic Racing Brake Fluid is formulated to provide the highest, most reliable performance under racing conditions, where braking systems operate at very high temperatures. RF1 exceeds all DOT 3 & 4 requirements and is compatible with all DOT 3, 4, and 5.1 fluids. (Not compatible with DOT5 or mineral-based brake fluids).